Everyday Math: Kindergarten Lesson with the Book "Math Curse"
Most Kindergarten students have a very limited understanding of the word “math” or “mathematics” and how it relates to their own life. Help them understand why math is important by showing them that numbers and math surround us with these number activities to include with your Kindergarten math lessons! 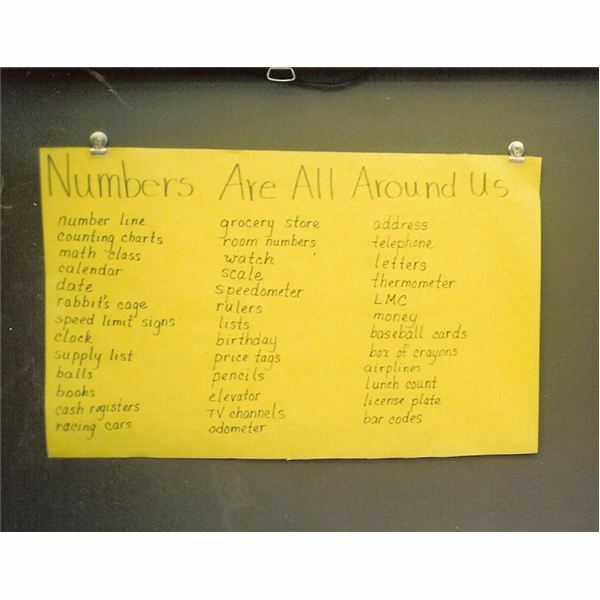 Together, brainstorm an extensive list of where numbers can be found. For example, your list might include words like calendar, number line, ruler, grocery store, telephone, price tag, sports jersey or scores. Come back together as a class and allow time for students to share the numbers they have discovered around the classroom. Then, spend some time discussing various situations when it is necessary to use math skills like counting, adding and subtracting. As part of your Kindergarten math lessons, you might also discuss times when understanding how to use math and number sense has been beneficial…like when they are trying to share cookies with a friend, count the number of pennies in their piggy bank, or keep track of the score in a playground game. When you are finished brainstorming the list, spend some time reading Math Curse, by John Scieszka. In this humorous book, the narrator is afflicted with a “math curse,” and suddenly recognizes how every situation can be thought of as a math problem. Your students will have everyday situations where math is important, and by incorporating this awareness into your number activities for Kindergarten math lessons, your students are certain to see math in a different light.